2.25x12 Wicker Oil Rubbed Bronze Floor Register Discounts Apply ! These decorative vent covers are what you will need to change up old metal floor registers in your home or business. Our decorative vent covers are made with a plastic adjustable damper which will prevent it from rusting. The damper allows you to control air flow by being able to open and close the register. 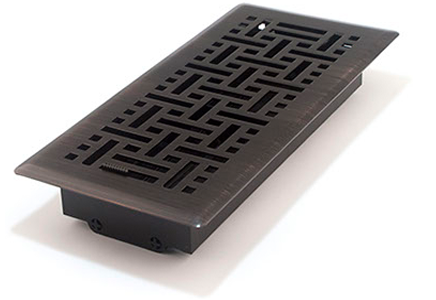 This metal floor register comes in a plated oil rubbed bronze finish and is covered with a lacquer which prevents tarnishing or corrosion. Our wicker oil rubbed bronze decorative vent covers are a great choice for you because of their quick drop in installation. These dazzling 2.25 x 12 metal floor registers can hold up to 200 pounds because they are made from a durable steel construction. ***Hint: According to industry norm, measure the metal floor register using the actual hole opening dimension and not the faceplate dimension. These antique brass decorative vent covers will fit a 2.25 x 12 inch hole opening. Actual Faceplate Dimensions: 3 5/8 inches x 13 3/8 inches. Our metal floor registers come in several sizes and an assortment of finishes. 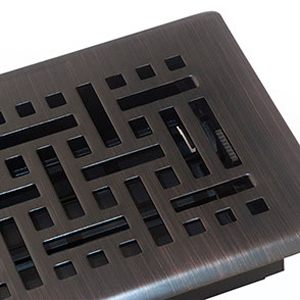 These decorative vent covers will rejuvenate your space, so try one today!